a common pruritic papular eruption appearing in a few hours and lasting up to several days on skin exposed to shortwave ultraviolet light (UVB); subepidermal edema and deep perivascular lymphocytic infiltration is seen microscopically. a common recurrent superficial vascular reaction to sunlight or ultraviolet light in susceptible individuals. Within 1 to 4 days after exposure to the light, small erythematous papules and vesicles appear on otherwise normal skin, then disappear within 2 weeks. A delayed allergic response is a possible cause. Tanning reduces the severity of the reaction. 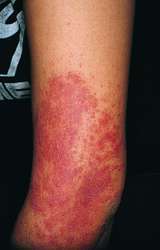 A common pruritic papular eruption appearing in a few hours and lasting up to several days on skin exposed to shortwave ultraviolet light; subepidermal edema and deep perivascular lymphocytic infiltration is seen microscopically. A rash occurring after exposure to sunlight, typically consisting of papules, plaques, or papulovesicles on sun-exposed skin. It is more common in fair-skinned patients and in women than in men or people with darker skin color. The rash is usually itchy but may produce a burning or stinging sensation. Avoiding sun exposure with protective clothing and sunblock helps prevent PMLE. Immune-modulating drugs are available for refractory cases. DISCUSSION: Polymorphous light eruption is an idiopathic disorder characterized by a delayed, abnormal response to electromagnetic radiation, usually sunlight, with a varied morphology of papules, plaques and vesicles on exposed areas of the skin. John LM et al, classified polymorphous light eruption into many clinical types. The papular form of polymorphous light eruption was seen in 38 patients and was the most common variant. Ten years follow up and evaluation of polymorphous light eruption.